We are committed to delivering highest quality without compromise, continuously improving quality of our solutions, processes and above all the skills of our employees. For this we conduct regular education and training programmes for all our employees. We don't just believe in maintaining highest quality standards of our services alone, but we also strive to maintain highest standards in Health, Safety and Environment management (HSE). 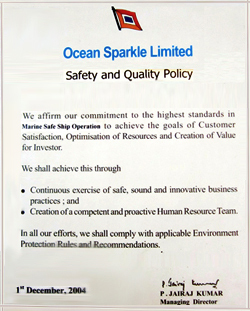 It is the company’s goal to ensure safety in ships operations, to ensure the safety of the crew and to avoid damage to property and the environment. We believe that Health, Safety and Environmental (HSE) considerations are an integral part of every job and activity carried out by the company. Our HSE Policy is committed to promoting Occupational Health, Safety and Environmental Management. With a total commitment to environment issues, we train our team in the latest pollution control equipment deployed at state-of-the-art Oil Terminals. A qualified and experienced HSE team ensures that the HSE Policy of the Organization is effectively implemented across all levels of operations. OSL has well established systems, guidelines and policies at its Operational centers, Regional offices and the Head office, which enables us to implement and constantly adhere to the Health, Safety and Environment Policy, ensuring an intrinsically safe working environment. We comply with all local, national and international regulations and statutory requirements and strive to be responsible to our Customers and all stake holders. Demonstrating visible commitment towards Quality, Health, Safety & Environment across all levels of management. Complying with the mandatory National and International rules and regulations and applicable Industry Standards, Guidelines and Codes. Continually adopting safe, sound and innovative business practices. Competent teamwork, optimization of resources and creation of value for our Stakeholders. Providing high quality service to meet our customer’s requirements each and every time. Continual improvement of our operating practices to provide injury illness free workplace and enhance our Safety and Quality Management skills. Provide resources including time, Personal Protective Equipment, Manpower etc., so that all aspects of work are under controlled conditions of safety. 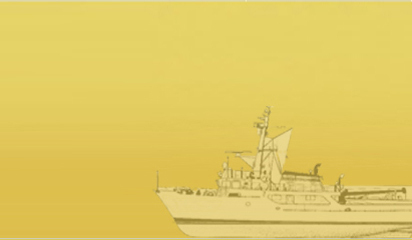 Establish safeguards against all identified risks giving highest priority to prevention of loss of life, injury to personnel, damage to ship, property and the environment. Provide a Safe and Healthy Work Environment which is free from Drug and Alcohol abuse. Ensure that safe working practices are established and followed so that persons afloat and ashore are able to effectively handle emergency situations. Provide regular Training and Skill Development to improve health and safety performance and its management systems. Continually analyse our Environmental Impacts of our operations and be proactive in minimizing them through continual improvement. We shall review our Policy periodically in order to ensure its continuing suitability. We shall communicate our Policy and practices to all our Internal and External Stakeholders.